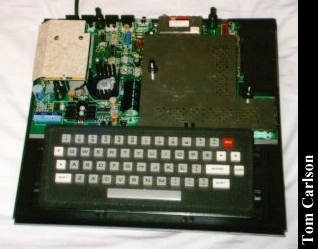 Tandy's first version of the Color Computer. It still has the funky black and grey color scheme of the other Tandy computers. Later versions would go to a white color scheme. This particular computer had its power and reset buttons snapped off in transit. I've been trying, with no success, to fix them. The floppy drive plugs into the side via a cartridge interface. 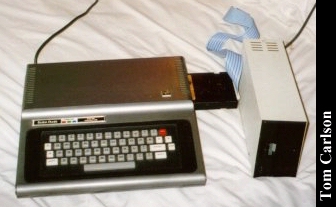 Closer view of the Color Computer 1. Top view with the cover removed. 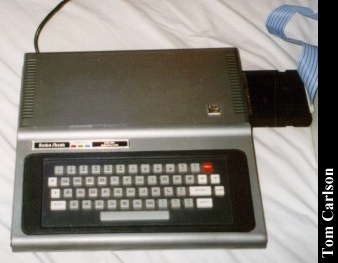 Click here to view all comments for the Tandy TRS-80 Color Computer 1 and to leave your own.